My friend G requested that I make a girly cake for her birthday, a shoe and bag cake. *gulp I got excited and scared I haven’t done anything like that and I have always refused friends request to make them some cute fondant cake. Sad to say i’m not artistic not like my mom and sister, I can’t for the life of me draw a straight line without a ruler. G insisted that she wants me and no one else to make the cake for her because she knows I can do it. A little voice inside me whispered “ofcourse we can do it” and so I told her to give me a day or two to decide but to not worry in case I wont be able to do the cake I have a friend who has been making fondant cakes. Searched the web for inspiration, tutorials, and read forums that would help and encourage me to make the cake. I told hubby C about it and he too was convincing me that I can do it and that he would help. And so I agreed. I showed G several cakes on flickr and agreed on the look. I have exactly two weeks to practice and prepare the cake. Below is my very first purse cake and beside it the sole of a shoe. 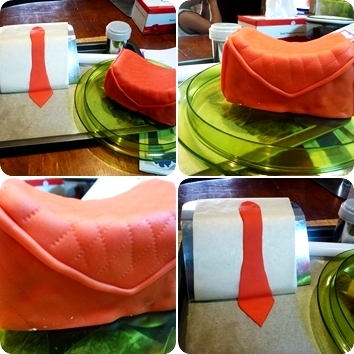 Though the cake is not perfect I am overly happy how I managed to make one which actually look like a purse (I think). hi there! nice one,cute..end of last year we joined a nationwide contest called FoodShowdown..ill post some of the pictures of every students who showcase their masterpieces in different categories.. keep it up..
WOW! this is phenomenal, you're so talented!! Congrats on being able to make this…can't believe your learned how to do this just from the web. You have some serious skills lady! Thanks Caroline. I'm still scared of fondant especially now that humidity is high this month. And not a lot of choices for cake decorating either only to shops sell stuff for making cakes pretty. This is amazing ! i would never have the courage to try something like this !! also could you please add… subscribe by email button ! i would appreciate it 😀 … P.S thanx for visiting my blog !